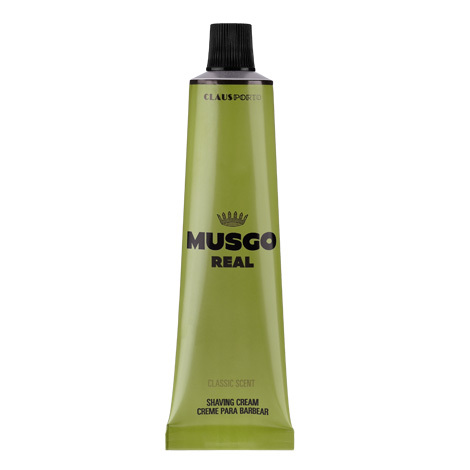 Classic Musgo Real Shaving Cream is a rich, lathering cream that can be used either with a brush or brushless, applied by hand. The natural base of lanolin and glycerin softens and moisturizes your beard, allowing the blade to come closer to your skin for a closer, smoother, longer lasting shave yet lubricates and protects from razor burn and irritation. Musgo Real Shave Cream is hand-made with natural ingredients in Portugal. The shave cream is stirred in an open kettle for three days which allows for the production of an very rich cream. Each kettle of cream yields only 300 tubes. For use with, or without a shave brush. This is a very high quality product. A tiny dab, about the size of a pea or less, works into a full lather with a brush and gives plenty of lubrication to your blade. And leaves the skin happy, smooth, and supple because of the lanolin content. A pleasure to use in the early morning! !